Nowadays titanium dental implants are extensively placed where titanium is a light weight metal and is not rejected by the body (bio-compatible). 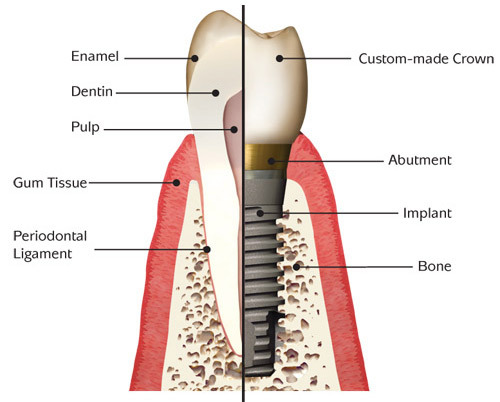 Dental implants have the highest success rate of any implanted surgical device. Missing teeth make too many people sit on the sideline and let life pass them by, however dental implants are the logic replacement of broken down or badly decayed teeth and also preserving the supporting bone. So ask your dentist about the different dental implant options that are available for you and don't let another day pass by without taking this first step to restoring your confidence and smile! *illustrations were taken from the official ICOI web site.